Not exactly a step-by-step; as I keep forgetting to take that sort of photo, but something close. Also, this dress didn't quite fit my mannequin and I don't have photos of it on my client; the weather was so hot on the day when she collected the finished dress, that we just couldn't face having a final try-on. My client had bought some gorgeous teal silk with contrasting in a deep burgundy and she had pictures of a very grand, haute couture, evening dress. 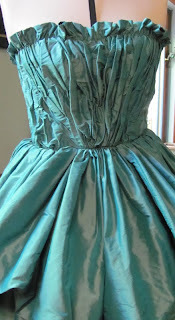 It was very 'organic', with ruched brocade fabric caught in gathers on a strapless bodice then released into a bouffant skirt which was folded up & caught in the front. How to achieve that folded skirt? 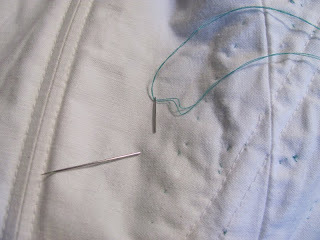 I experimented with lots of pins ... but how to sew that to the rest of the skirt ? Cowardly leaving the skirt conundrums till later, I started with the bodice. Although it looks like the fabric is just scrunched up and thrown at the body where it has miraculously stuck! there had to be more of a construction underneath. 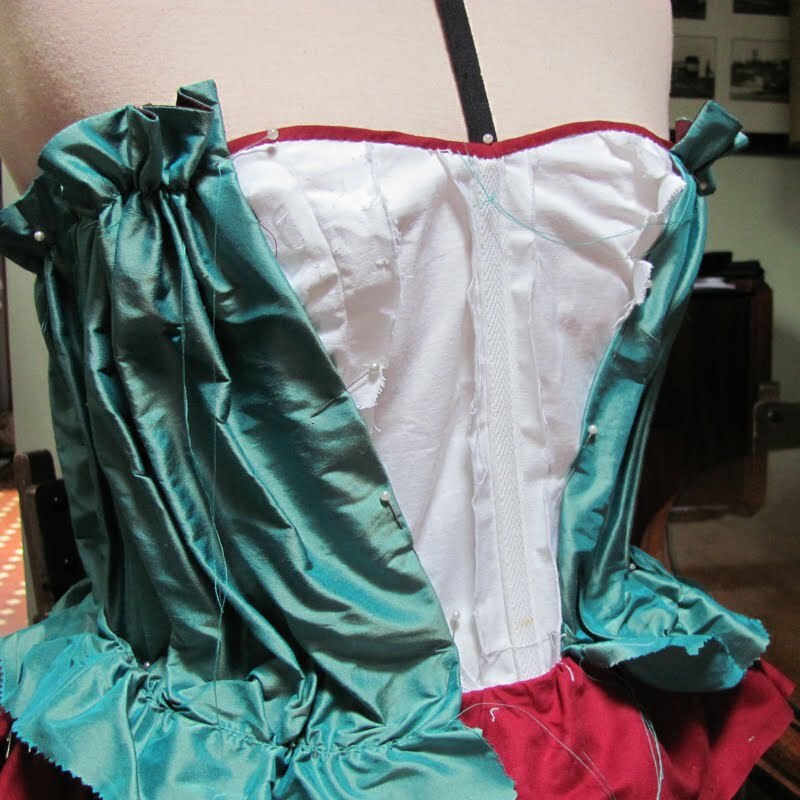 A light-weight corset style bodice in coutil with thin bones (some plastic, some spiral steels). Here is the underneath of the dress - the foundations - upside-down and inside-out, showing the side that goes next to the skin. 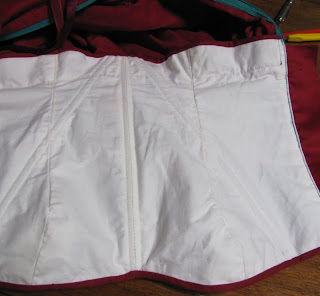 CF with angled-into-the-waist boning, burgundy binding, the zip is on as is the 'petticoat' layer (in burg cotton) which the silk skirt is going to get stitched to - well I'd worked out that much! 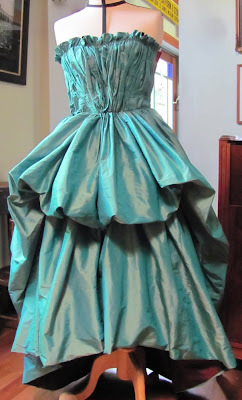 And here is all of that on Daphne (that's what I call this mannequin). All inside-out looking but that gets hidden later. 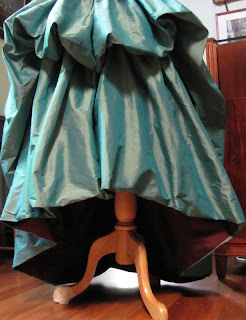 The top frill of cotton petticoat ended up getting chopped away later - it made the skirt too bouffy. Here the bodice gathers after stitches & the skirt (minus that front panel) sewn on. This was something of a problem - the boning in the underbodice made difficulties in stitching on the silk layers! 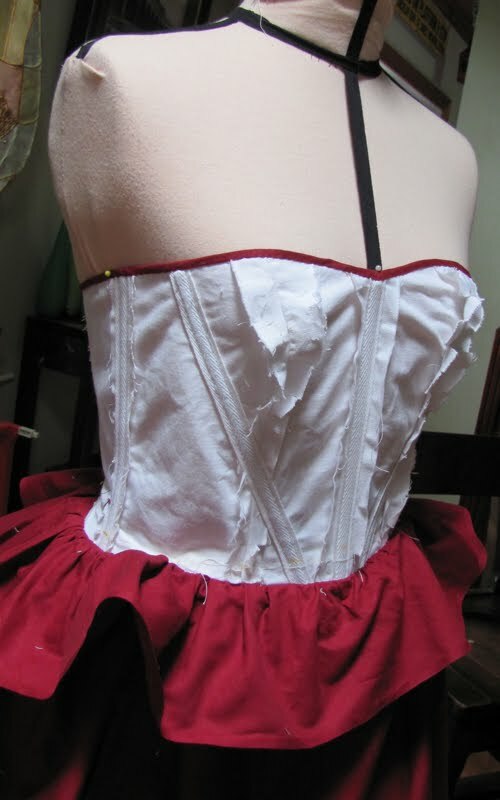 Had to machine up to the bones - and skip those bits and hand-stitch later. Sounds easy enough but with all that fabric it was hard to find the bones until ... crunch, another needle gone! 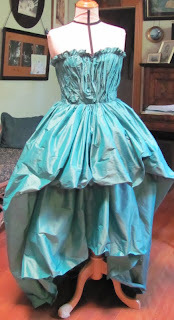 Well, to cut a long story short (or to fold a long skirt shorter!) 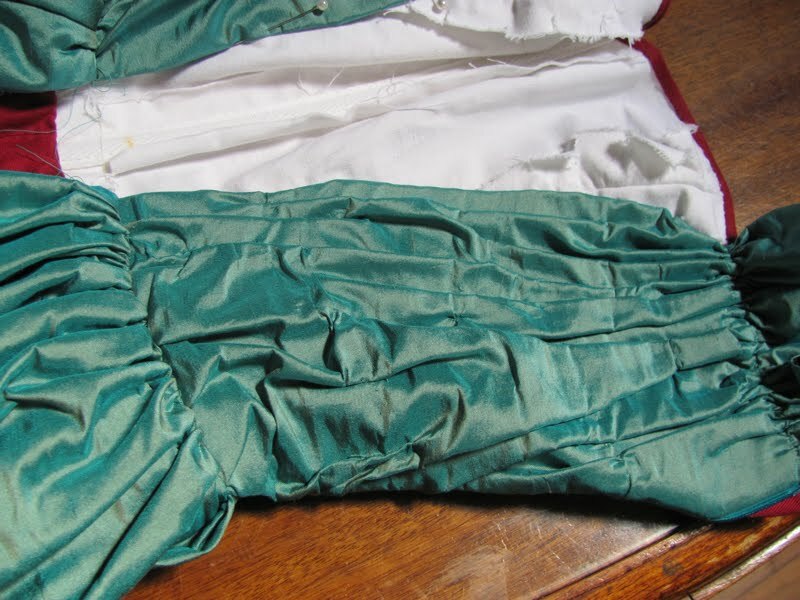 that fold went just as I had hoped, quite easy really - and it is stitched to the burg cotton petti layer. Played with the folding and gathering till it looked just right and the length at the front was as my client wanted. And here you can see that the inside of the silk skirt is lined with the burg silk (which is also stitched to the petti. Love the way the skirt does that 'waterfall ripple' down the sides. you can also see Daphne's 'bandaged' foot - actually she is a bit lop-sided and this is a booster is to correct that.